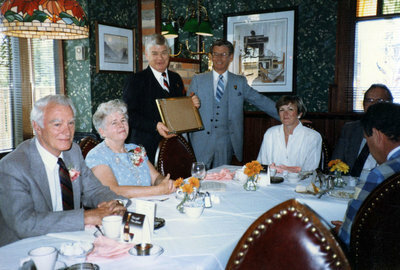 A colour photograph of the presentation for Good Corporate Citizen to Cullen Gardens and Miniature Village in 1983. In this photograph from left to right: Len Cullen, Connie Cullen, Mayor Robert Attersley, Bill Wallace (Town Administrator, Town of Whitby), Lorna Ramsay(Director of Marketing, Town of Whitby). Leonard Cullen was a gardener, entrepreneur, and the founder of Whitby’s biggest tourist attraction, Cullen Gardens and Miniature Village. He was born on February 5, 1925. In 1947, Cullen purchased John A. Weall Landscaping Company for $3000 and opened five Weall and Cullen Nurseries in the GTA. The growth of his garden centres meant that Cullen needed land to grow more plants in order to keep up with demand so in 1954 he and his brother Ken purchased land on Baldwin Street (Highway 12), just north of Taunton Road. His early successes in the nurseries allowed Cullen to realize his dream of building a show garden for the public. Cullen Gardens and Miniature Village was built on 14 hectares of valley farmland at Taunton Road and Cochrane Street, just west of the land Cullen originally purchased to grow his plant material. The gardens, with Lynde Creek flowing through the property, opened in May 30, 1980 and attracted visitors from around the world every year. Cullen’s dream also incorporated his interest in local history; he purchased Whitby’s Lynde House, the oldest home in Whitby, and moved it to Cullen Gardens in 1987 in order to preserve and protect it from demolition. As Cullen Gardens grew in popularity a restaurant and banquet facilities were added to the grounds and day camps, special events, and festivals were held on the property. In 2006, the Town of Whitby purchased the property and it is now a public park. Cullen died on August 15, 2006 at the age of 81.
Business Man of the Year, 1983, Photographer Unknown. Whitby Archives A2013_042_012.